Modern custom Craftsman home rebuilt in 2009, with plenty of curb appeal, quality workmanship, high-end amenities and attention to detail. 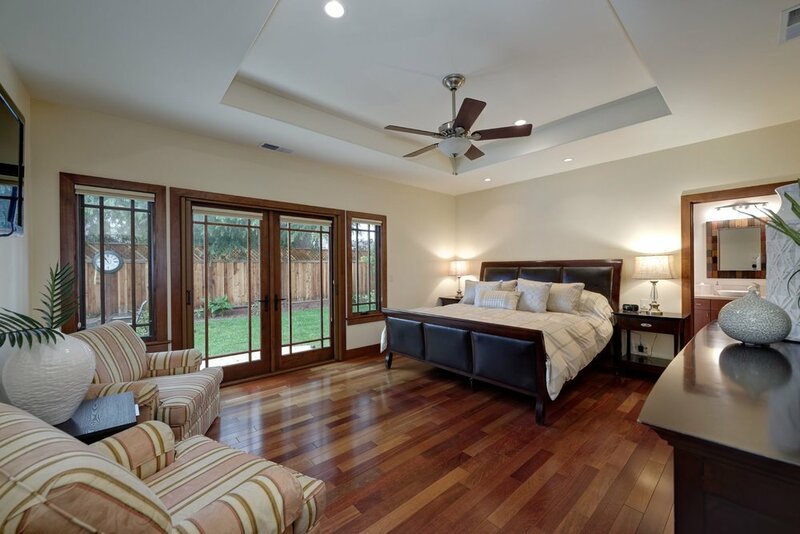 With a warm and inviting ambiance, this elegant home offers Brazilian cherry hardwood floors, an open concept floor plan, energy saving features, and more! Main living spaces overlook the stunning backyard, and the gourmet kitchen will delight the home chef with its high-end stainless steel appliances, granite counters, large island, and thoughtful design. A separate butler pantry lets the kitchen be the star during parties and entertaining, and garage access to this space makes unloading groceries a breeze. Other highlights include a living room with vaulted ceiling and gas fireplace, and Master bedroom with a gorgeous marble en suite. Luxurious living extends outdoors to the sparkling pool and spa with a waterfall backdrop, travertine tile deck, fire pit, lawn area and covered patio with a built-in TV and outside kitchen. Beautifully crafted home with lush manicured landscaping, travertine porch and leaded glass accented front door. Highlights include Brazilian cherry hardwood floors, vaulted/tray ceilings, recessed lighting, Velux skylight, Kolbe & Kolbe windows, cherrywood cabinets, solidcore cherry wood interior doors, and Hunter Douglas blinds. 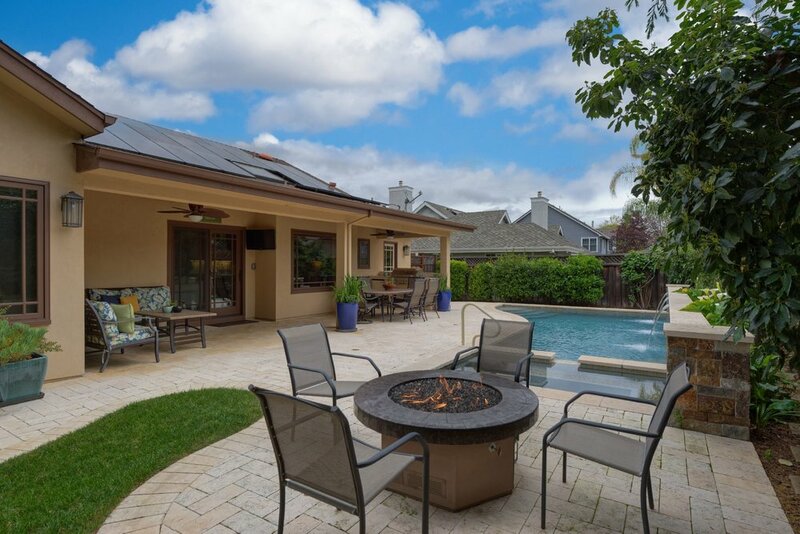 Bonus features include owned clean home solar system comprised of 26 panels installed in 2014 (resulting in average PG&E bills of $10/mo), Nest thermostat, water softener, two tankless hot water systems and recently replaced perimeter fencing. Formal dining room framed by elegant arches and inviting living room with a soaring vaulted ceiling, thermostat-controlled gas fireplace and sliding doors with retractable screens opening to the pool and covered patio. Gourmet kitchen boasts granite countertops, Idaho Evelyn Brazilian cherry cabinets with undermount lighting, glass display cabinets with glass shelves and accent lighting, a striking Antequera stone backsplash, adjacent casual dining area, and a large island with seating space, pendant lights and eye-catching hammered nickel sink. Thoughtful custom storage includes a knife drawer, utensil dividers, bread storage, slide-out shelves, appliance caddy and corner cabinet pullout organizer. Stainless steel kitchen appliances include an Electrolux Icon French door refrigerator, wine fridge, 6-burner cooktop and double oven, plus a Sharp built-in microwave, Bosch dishwasher and a Fisher & Paykel dishwasher drawer located on the island. Adjacent butler pantry and pantry room with granite counter includes built-in storage cabinets and convenient garage access. 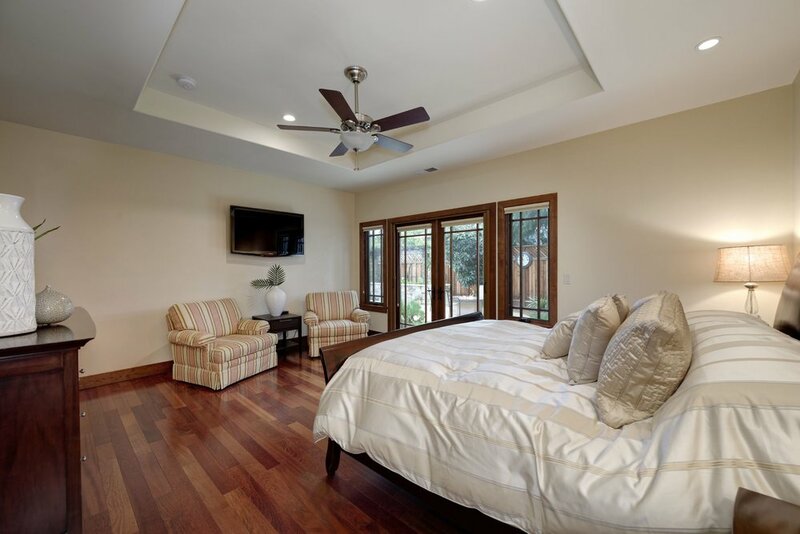 Spacious Master bedroom highlighted by a decorative tray ceiling with fan and French doors with retractable screens opening to the backyard. A large walk-in closet with custom organizers includes a fold-out ironing board. Luxurious en suite with crema marfil marble finishes features a double storage vanity with vessel sinks, separate make-up counter and an oversized shower with bench seat, utility storage shelf, multiple shower sprays and body jets. 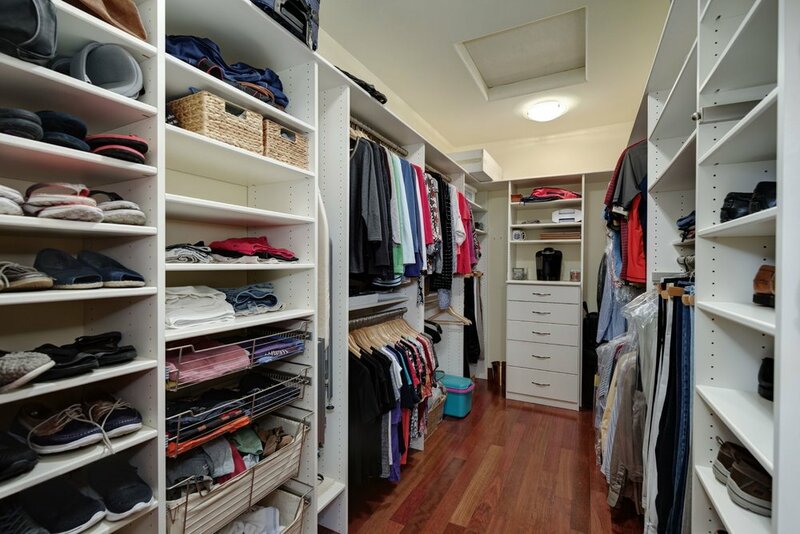 Two sizeable additional bedrooms include closets with built-in organizers. One room features a glass entry door with a retractable shade. Hall bathroom is tastefully finished with a glass vessel sink, waterfall faucet and recycled glass vetrazzo palladian grey countertop with storage, and also features a shower/tub combo with contemporary tile and glass accents. Indoor laundry provides a utility sink, storage cabinets and exterior access. Washer/dryer included. Extra storage is provided by hallway coat and linen closets. Fabulous outdoor living area features a heated pool and spa with indoor controls, a stone/waterfall backdrop, travertine tile deck, fire pit lounge, and covered patio with a built-in TV, dual ceiling fans for summer comfort and built-in kitchen with an American Outdoor grill and refrigerator. Lush, landscaped grounds include a lawn area, garden, irrigated side yard planter boxes, and fruit trees including orange, lemon, lime and avocado. Clean solar system with 26 panels installed in 2014; average PG&E bill in $10/mo. Two-car garage has an epoxy floor finish and built-in storage cabinets. Award winning schools (to be verified by buyer): Blossom Hill Elementary School, R. J. Fisher Middle School and Los Gatos High School. 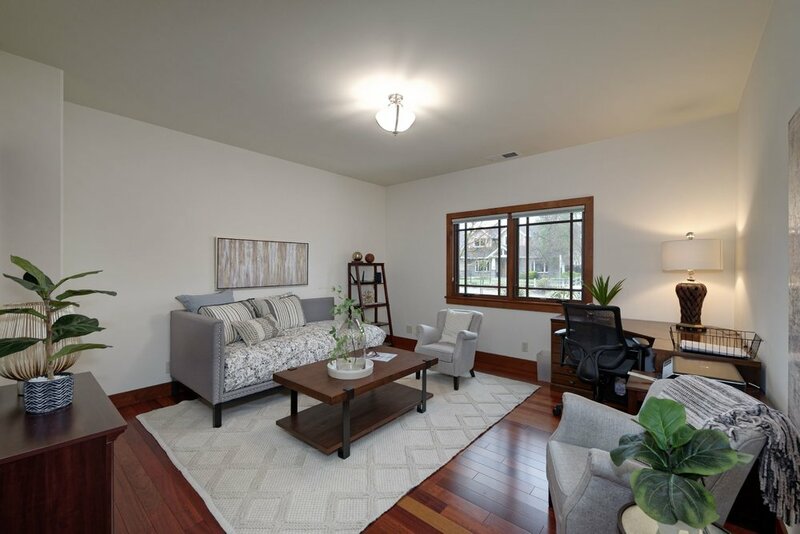 Conveniently located in a family-friendly neighborhood, walking distance to local favorites including Whole Foods, Lunardi’s Market, Nob Hill, Peets and Starbucks. A short drive to lively downtown Los Gatos, access to Hwy 17 and 85, and tech companies including Netflix.